Dr. Washington Burns wants to fight asthma. Now, he gets to do that with the Breathmobile, a compact asthma clinic in a van that provides free treatment to kids under age 18 in Alameda and Contra Costa Counties. After working as a medical director at the California Pacific Medical Center in San Francisco for 34 years, Burns co-founded the Prescott-Joseph Center in West Oakland in 1995. Since then, the non-profit has been working to better the lives of residents in Oakland by offering family, health and culture programs. In 2001, Burns learned how severe the asthma rates are for children in Oakland. According to the Prescott-Joseph Center, the national asthma rate for children between ages 5 and 17 is one in ten, but it’s one in six in California and one in four in Alameda County. Oakland, among all the cities in the county, has the highest rate of kids’ emergency department visits due to asthma—40 percent higher than the county rate. African American children account for 12 times more visits than Asian/Pacific Islanders and four times more than Latinos and whites, according to the center. Asthma is a chronic lung disease causing chest tightness, shortness of breath and coughing. It affects people of all ages, but most often starts during childhood. When exposed to common triggers like smoke, dust, pets or even weather changes, patients’ airways narrow, allowing less air to flow into the lungs. If symptoms get more intense, patients can have possibly fatal asthma attacks that require emergency care. At first, with his colleague Mary Frazier, a pediatric nurse, Burns went into schools to tell teachers, coaches and students about asthma. This went on for a few years before they realized that they weren’t getting parents involved enough to make real progress, said Frazier. That was when Burns heard about the Breathmobile program, a collaboration between Los Angeles County and University of Southern California. Since 1995, staffers from the asthma clinic on wheels had been examining kids, giving medications and educating parents on asthma triggers “to maximize the convenience of the family,” said Frazier. By then, the Los Angeles Breathmobile had already collected data to prove it reduced missed school days, trips to emergency departments and hospitalizations for kids who were receiving treatment from it, said Frazier. In 2009, the Prescott-Joseph Center purchased a 33-feet long Winnebago and turned it into the first mobile asthma clinic in North California. Modeled after the first Breathmobile, the Northern California version has on board medical specialists ranging from doctors, respiratory therapists, registered nurses, nurse practitioners and medical assistants. The mobile clinic visits preschools and K-12 schools and treats children under age 18 with asthma for free, outside of campuses, every four to six weeks. The Breathmobile team provides a full service, including diagnosis, treatment, prescriptions, medicine supply and education—all at no cost. Burns, who is now the center’s executive director, was glad to see his dream realized. “We knew how good the result was going to be,” he said. A typical visit on the Breathmobile takes about thirty minutes, longer for first-time patients. It starts at the intake station, where a staffer gathers medical histories from the patient and his or her parent. They then check the child’s vital signs, including blood oxygen, blood pressure, pulse and temperature, along with height and weight. At the pulmonary station, the nurse conducts a spirometry test, which measures lung function by having the child blow into a tube. When finished, the child is given papers and crayons while the doctor makes a diagnosis and comes up with treatment plans with the parent. The Breathmobile started off by visiting the Anna Yates Middle School in Emeryville and then expanded into schools in Oakland, Berkeley, San Leandro, Alameda, San Lorenzo and some cities in Contra Costa County. Between 2013 and 2014, the Breathmobile visited 33 schools and treated 253 children. According to the Prescott-Joseph Center, the year before entering the program, those 253 children were collectively responsible for 274 emergency department visits, 138 hospitalizations, 71 calls to 911 emergency services, and 541 days missed from school due to asthma. But between 2013 and 2014, those 253 students only accounted for a total of 13 emergency department visits, 3 calls to 911 and 30 missed school days, and they had no hospitalizations. William Haight, now 11 years old, was the second patient to sign up for the Breathmobile when it started. According to his mother, Melissa Haight, William has gone from having two or three asthma attacks a year, to not having had one for two years. “I did not think it was possible, but now he plays basketball,” Haight said. According to the Alameda County Health Data Profile, published earlier this year by the Alameda County Public Health Department, the prevalence of asthma in the county is highest for Hispanics and African Americans. And between 2013 and 2014, over 86 percent of the Breathmobile patients came from those two communities, according to the Prescott-Joseph Center. Burns says he keeps “three E’s” in mind when it comes to asthma: education, economy and the environment. According to the data profile, Alameda County residents of households that make less than twice the federal poverty line have a higher prevalence of asthma than those who make more than that. (In 2014, the federal poverty line was defined as $11,670 for households of one and $23,850 for households of four.) According to the California Health Interview Survey taken during the years 2009, 2011 and 2012, the lower income households have an asthma rate for kids of 23.2 percent compared to 15.8 percent in families that make more than twice that federal limit; for adults, it’s 15.9 percent compared to 13.4 percent. As Frazier points out, low-income families are more likely to live in sub-standard housing, which may contain rats, roaches, mold and smoke, or near heavy industry, trains and freeways, all of which can be asthma triggers. Barbara Parker, coordinator of health services for the Oakland Unified School District, supports this connection. 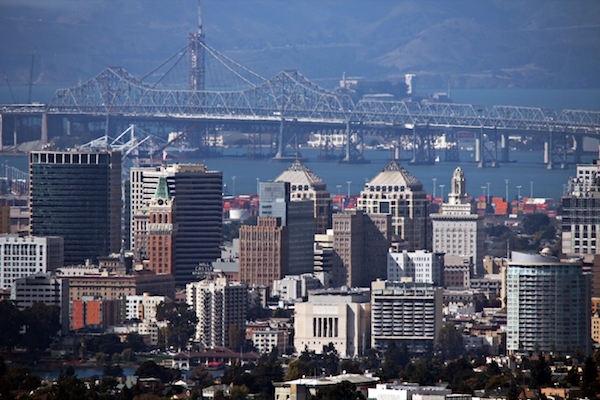 According to the school district, a higher rate of asthma (22 percent) is seen in schools and neighborhoods located near these areas than those aren’t, due to uncontrolled environmental pollution emitted by unregulated industries, freeways, the Port of Oakland international shipyard, and transporting large container trucks. Other contributing factors to high asthma rates are lack of health insurance, access to medical providers, and parent education regarding asthma triggers, wrote Parker in an email. Although it cannot be cured, asthma can be managed by learning about the disease, so that patients experience less frequent or less severe attacks. But according to Frazier, just learning about the right time to take the correct medication can be complicated. Different combinations of medicines should be taken at different times, according to different symptoms. Patients are expected to follow individual asthma action plans to recognize their patterns, so that they know what to do when their asthma turns worse or better. However, when either education or economic resources are limited, people often choose quick-relief medications, which only provide temporary aid, over more expensive long-term control medications that target at the causes of asthma — “until things either get better or so bad that you have to call 911,” Frazier said. Ambulances rides and emergency department visits can be expensive, especially for families without health insurance. Moreover, public schools lose money for each day there is an absent student, making asthma one of the highest costs of absenteeism for schools. According to the center’s estimation, the Breathmobile has saved a total of $3,615,885 between 2013 and 2014 that would otherwise have been spent by patients on medical services or lost in state funding to schools. According to Parker, parents of 11 percent of students (approximately 4,000) in the OUSD report that their kids have asthma. The number in the West Contra Costa County is 20 percent—about 10,000 students—according to Frazier. The Breathmobile is able to treat only a very small percentage of students. “But we get excellent results from the small percentage,” said Frazier. Unlike the Los Angeles Breathmobile, the Northern California Breathmobile is not funded by a local school district. (According to Parker, the OUSD has not had a discussion about funding the Breathmobile.) The only government funding the Prescott-Joseph Center receives is from the Bay Area Air Quality Management District. “We have to rely on people who believe what we do,” said Burns, referring to donations from groups like Chevron, Kaiser Permanente, CISCO Foundation. The very first funding the center ever received to help the program running was from the Port of Oakland, the first port in the United States to fund an asthma clinic. “They willingly admitted that they were causing lots of air pollution,” said Burns. “I think that showed a lot of integrity.” As a department of the City of Oakland that operates independently, the port is still funding the Breathmobile. According to Robert Bernardo, the port’s communications manager, they consider their donations to the program to be made from port funds, rather than city funds. The story was updated to correct the annual expenditure of the Breathmobile. The Northern California Breathmobile parked at Jack London Square. The Breathmobile has an intake station, a nurse station, a pulmonary station and a doctor’s office. Medical staffers take the patient’s vital signs and conduct the spirometry test, which measures lung function by having the patient blow into a tube.